I don’t want to delete this entry. Our family history is part of me and us. Thus I leave this text as it is as a piece of memory, where we came from. It might also help understanding our relation to several friends. I am very thankful for the time the Eurobrats had within Yasmin’s Brat Pack. Although being two families now the Eurobrats and Yasmin’s Brat Pack will stay connected by many ways. They become twinned familes and are interwined by many ways. And our families will stay side by side as friended families. Hence, the Eurobrats will stay in Yasmin’s family and friends group, and Yasmin and her brats will stay in the Eurobrats group. And here’s a bit for you to puzzle connections and relations within the Brat Families, even if the Yasmin’s family part is a bit outdated and not valid at all anymore. In addition Yasmin has left SL for good End of April 2013. 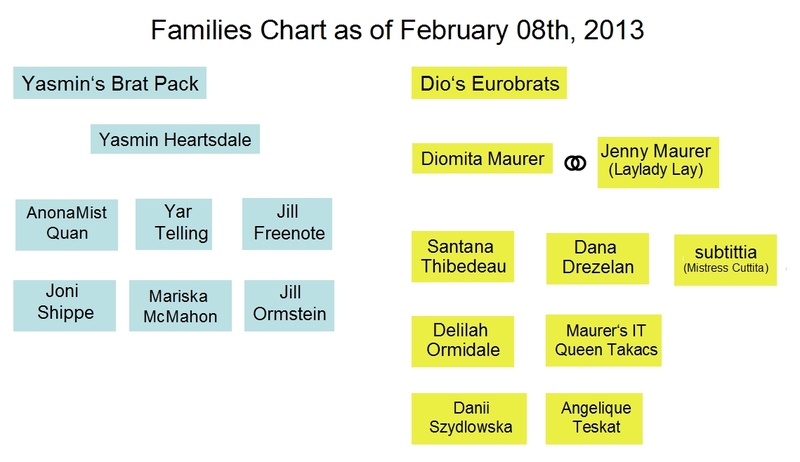 Nonetheless the Family chart still gives you a little insight how we were and are still connected to eachother.